Simply BREAD! 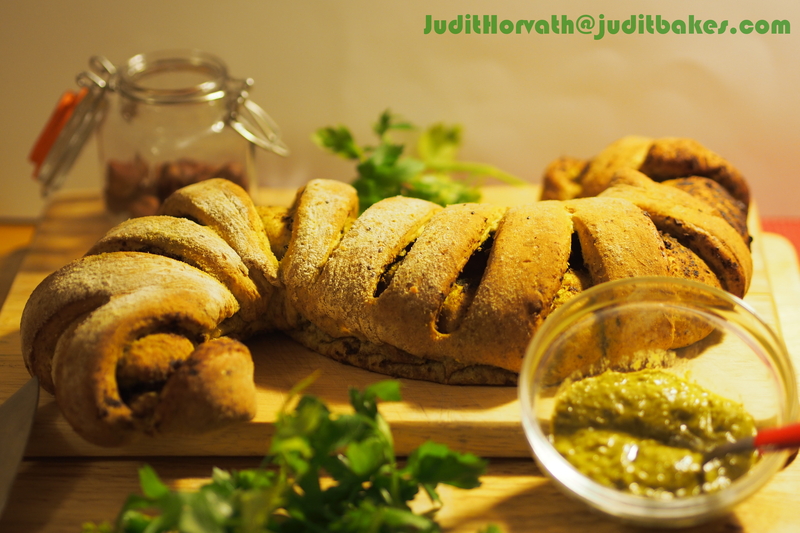 Whole Wheat Loaf Filled With Foraged Mushroom Puree and Wild Herb Pesto | When Judit bakes...bread and better.. 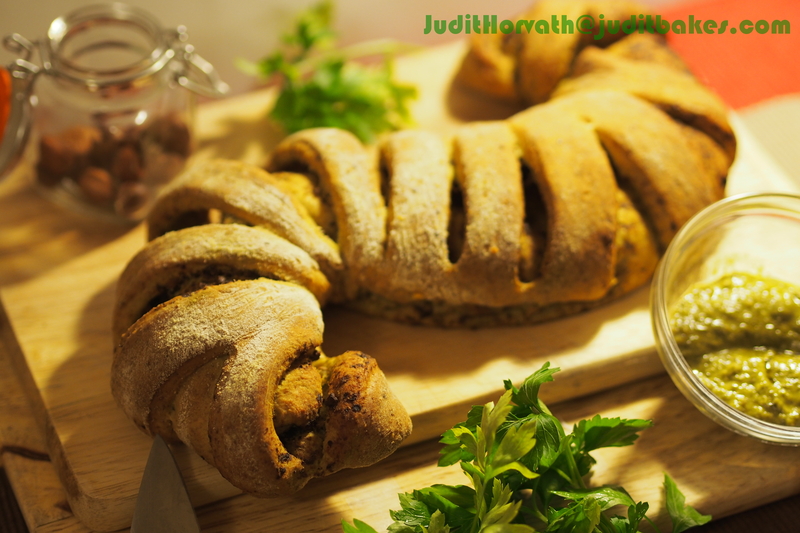 There would be so many adjectives required to describe the attributes of this bread – its appearance, its smell, its taste and aftertaste, its memory, its hosting skills… – that it is highly advised to avoid even trying, so this bread should simply be called, the BREAD. To determine what is the best bread is certainly depends on the consumer, however, what can be called bread, good bread, most definitely should have a description protected by law, even though the description is simple. Food made of flour, water, and fresh yeast or another leavening agent (baking soda or fermented starter culture), mixed together and baked. Rather than artificial additives, only the virtually infinite combinations of different flours, and differing proportions of ingredients should result in the wide variety of types, shapes, sizes, and textures. Professional baker recipes are stated using a notation called baker’s percentage. The amount of flour is denoted to be 100%, and the amounts of the other ingredients are expressed as a percentage of that amount by weight. As my bread, my baker’s percentage is much more simple: use 100% good ingredients, and the resulted leaf will be simply 100%. Take the mushrooms, wash and peel them; chop them as finely as possible; put them in a deep saucepan, with a knob of butter and the juice of a lemon; stir until the butter has turned to oil; add a pinch of flour, a cuillerée à pot [a ladle full] of stock, salt and pepper; reduce until your purée is sufficiently thickened and serve. Toast the pepper and hazelnut slices in a dry skillet until fragrant, and grind finely using a mortar and pestle. Add the salt and garlic and crush into a paste. Add the lemon zest and smash into a nut butter. Start working the herbs in, a few leaves at a time, blend until consistent. Stir in the cheese with a fork, before using the pestle to gradually work in the oil. Taste and adjust to liking. Combine the warm water, yeast and sugar in a large bowl. Stir in the oil, then half the flour. Mix in the rest of the flour, reserving 100 g. Sprinkle the remaining 100 g flour onto a clean work surface. Tip the contents of the bowl out onto the floured work surface and knead for 5 minutes, kneading in all the flour. Lightly grease the bowl with some oil, put the dough into the bowl, cover with a clean dish towel. Leave in a warm place to rise until doubled in size. Once risen, lightly sprinkle a work surface with some flour. Tip the dough out and roll it into a large, thin rectangle. Spread with the puree, then the pesto, then scatter over the cheese. Starting at the long edge, tightly roll the dough up into a sausage shape. 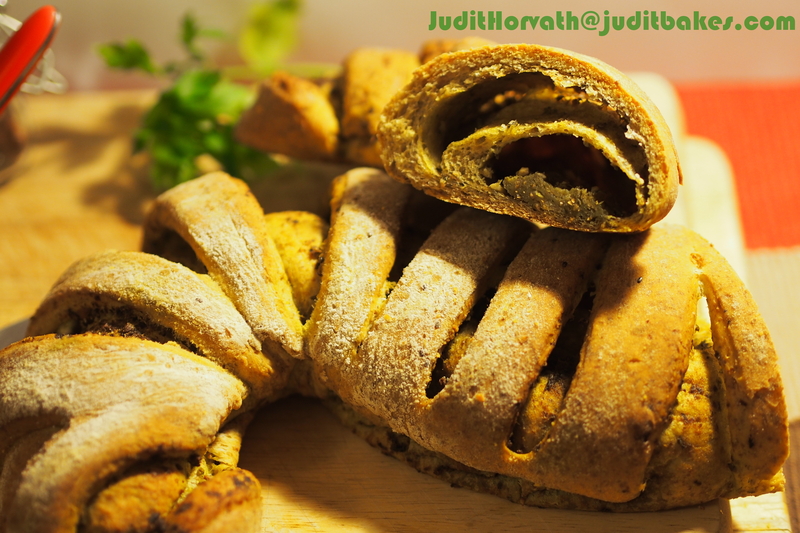 Use a sharp knife to cut the into the dough 3/4 deep, leaving about 3 cm between the cuts. Place it onto a lined cookie tray, and shape into an “S”. Cover with a clean dish towel and leave to rise again for 15-20 minutes while you preheat your oven to 220 degrees C. Bake for 45 minutes until well risen and browned. 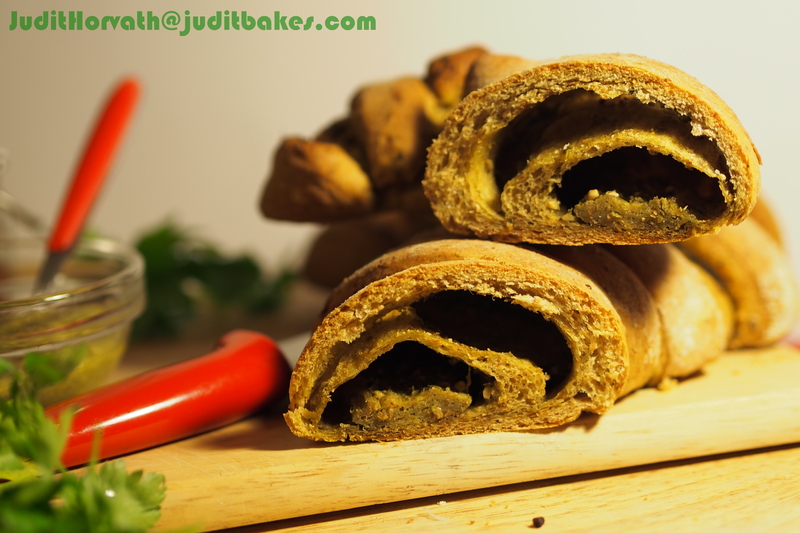 This entry was posted in Baked treats, Bread, Flavoured breads, Just Everything, Savoury bakes, Special flours and flavours, Treats for Life, Yeasted bread and tagged breakfast, field mushrooms, food, infinite combinations. Bookmark the permalink. This is so different – I love being able to use foraged ingredients. Unfortunately I have not yet graduated from blackberries! 🙂 Mastering only takes three simple things: patience, practice and love! Be brave, keep trying and “graduation” will soon follow! J. And one day…I must try some of these masterpieces. Cheers and have a great coming weekend! 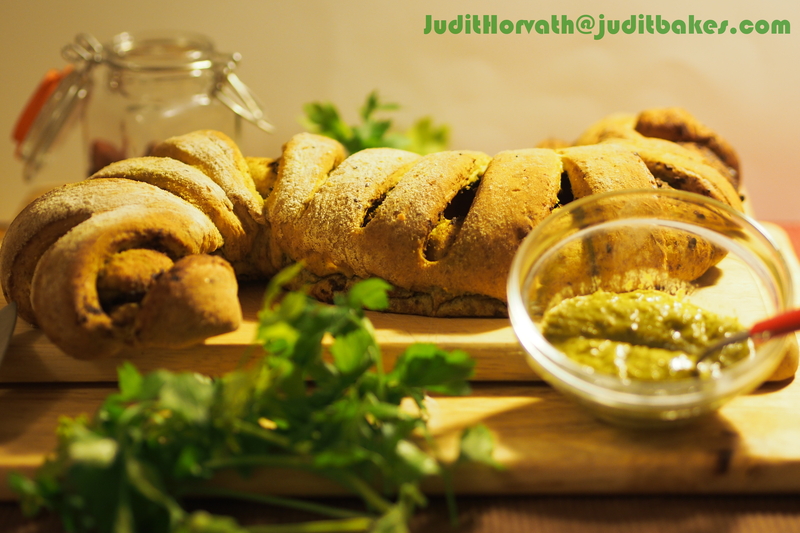 It is truly fantastic to have readers who appreciate the soul behind my recipes (which are, in my case, inseparable) . Thank you very much for reading and commenting, it means a great deal! I hope to offer you tastes in return one day! J.